My seventh stadium of 2014 was on Saturday 19th April at St James' Park in Newcastle upon Tyne, Tyne & Wear. The match was Newcastle United vs. Swansea City in the Premier League. 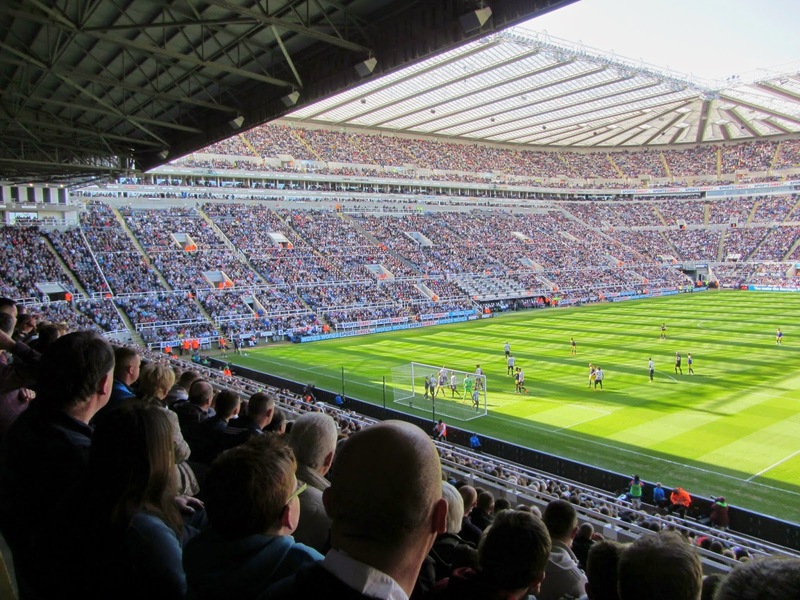 St James' Park is located very close to Newcastle city centre on the edge of Leazes Park. This area of the city is currently being redeveloped with large student apartment blocks springing up opposite the stadium in recent years. The stadium is served by St James Metro Station with the main Newcastle railway station around half a mile south of the ground. 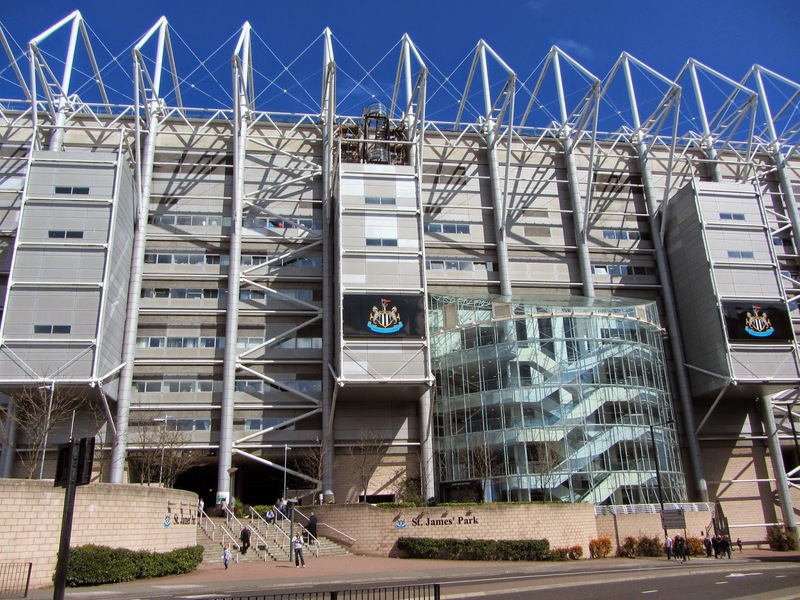 St James Park has been home to Newcastle United since 1892 with the stadium's current look built through the 1990s into the early 2000s to give a current capacity of 52,405. The lower tier of seating of the ground forms a continuous bowl around the pitch with the additional tiers on the north and west sides of the venue. The Milburn Stand is the main stand and houses the club reception as well as its hospitality areas. This stand also includes an atrium on the outside for the escalators to the upper levels. On the inside the premium seating is situated in the centre of the lower tier along with the press seating which is directly above the dugouts. The stand also has a row of corporate boxes in between the upper and lower tiers which run for the length of the stand and extend round to the end of the adjacent Leazes End. The Leazes End is the other stand that was significantly expanded during the late 1990s - the combined cantilever roof is the largest in Europe. Away fans are allocated the north-east corner of the stand so are a great distance from the pitch. The remaining two stands are much smaller in stature - the East Stand, which is hemmed in by housing, and the Gallowgate End. This end of the ground has a sports bar and the two-floor club shop within it. The raised concourses outside the arena also give good views out over the city of Newcastle. Newcastle’s good start to the season had waned by the visit of Swansea with the Magpies on a run of four straight defeats prior to the game. The game started in comical fashion when Jonjo Shelvey’s drive was deflected into the face of referee Chris Foy knocking the official to the ground. Play soon resumed though Foy was replaced by Anthony Taylor shortly afterwards. In the 23rd minute Newcastle took the lead when Luuk de Jong found Shola Ameobi in the penalty area - Ameobi was able to use his strength to hold off a couple of Swansea defenders before beating Michel Vorm from 12 yards. Swansea had the lion’s share of possession in the opening 45 minutes and in first half injury time grabbed a deserved equaliser as sloppy Newcastle defending allowed Wilfried Bony to nod in Ben Davies’ corner kick. The hosts created more opportunities in the second half with Dan Gosling and Vernon Anita both going close. Swansea remained a threat on the counter-attack and a good save from Tim Krul was required when Bony was set clean through by Marvin Emnes in the closing minutes. In second half injury time Newcastle were undone by another Swansea counter-attack and as Emnes raced into the back he was scythed down by Cheick Tiote for a clear penalty. Bony, who had been excellent all game, stepped up and cooly dispatched the penalty to all but guaranteed Swansea another season in the Premier League.